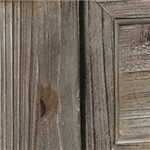 You can have an earthy look for your living room with help from the Pemberton collection. The rectangular-shaped piece carries pine veneers as well as fir solids and gets its natural appearance from its smoked barnside finish. Trumpet side pieces punctuate each piece while the lower shelves are great for keeping books, DVDs, magazines and remote controllers. 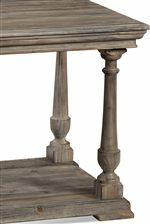 There will be a lot to like with the Pemberton collection in your home. Browse other items in the Pemberton collection from AHFA in the area.